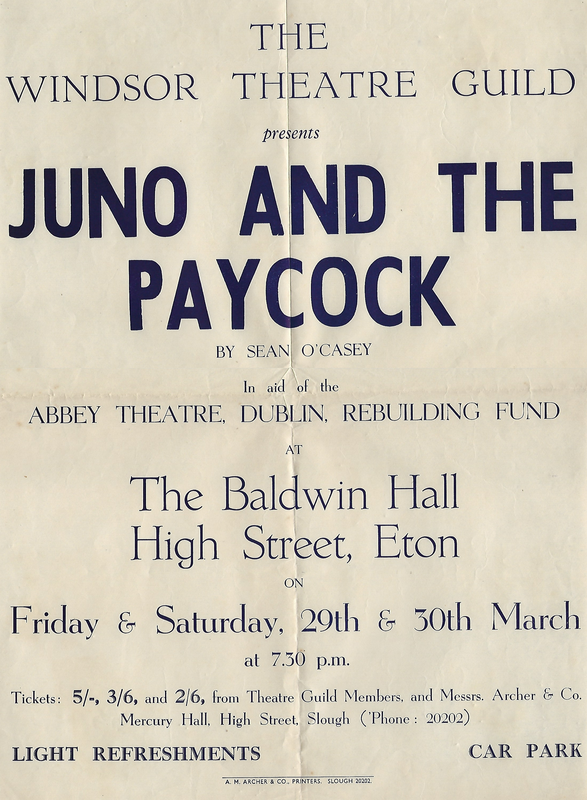 David saw the Abbey Theatre production of Juno and the Paycock with Harry Brogan as the Captain and Eileen Crowe as Juno. 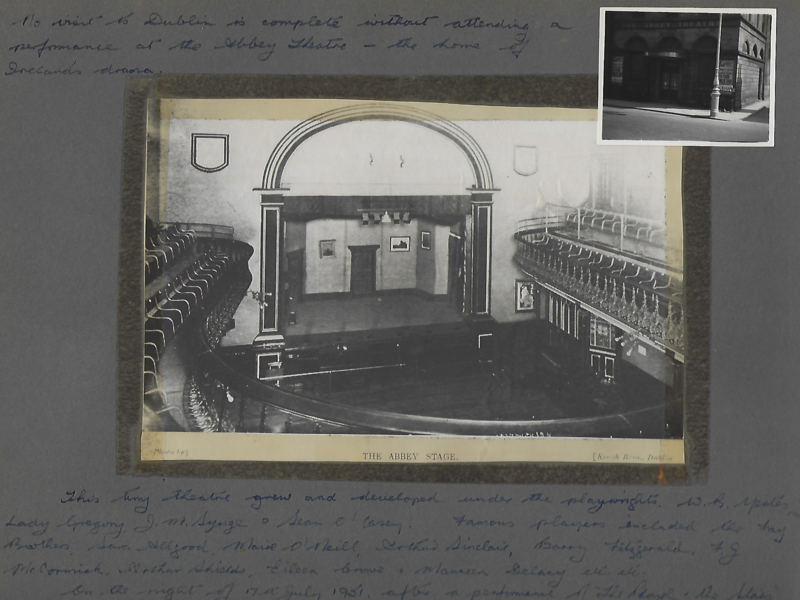 The performance was staged at the Queen’s Theatre as the Abbey itself had been badly damaged by a fire (after a performance of The Plough and the Stars). 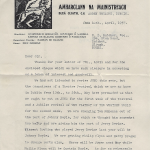 He met with Tom McKenna, who played Johnny, and saw a show at the Gaiety Theatre with him before returning to England. 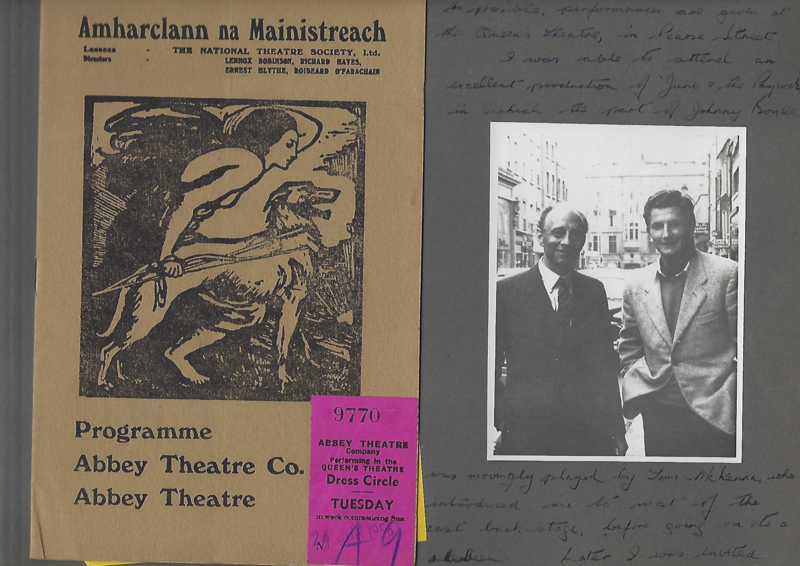 … along to a performance at the Gaiety Theatre of a new play by Denis Johnstone, “The Golden Cuckoo”. 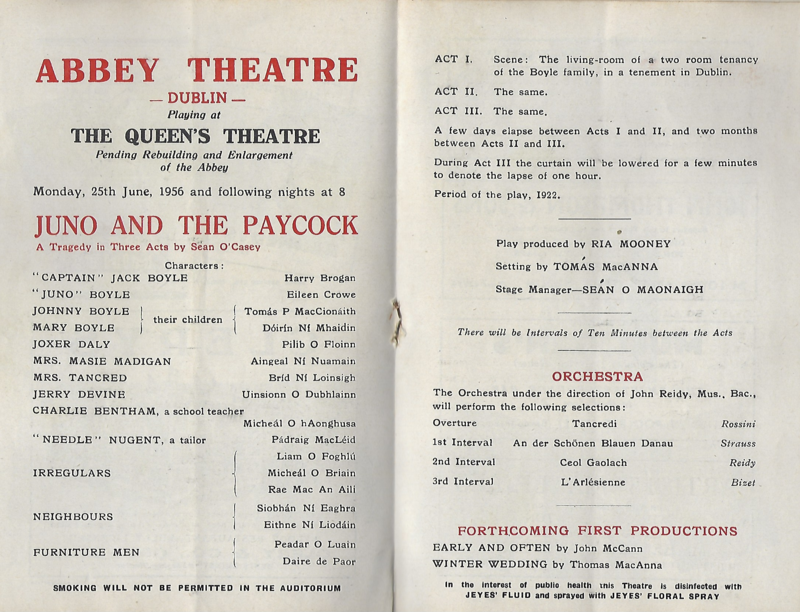 Many of the Abbey Players were in the audience for the matinee, & Tom McKenna brought along his wife Mae. 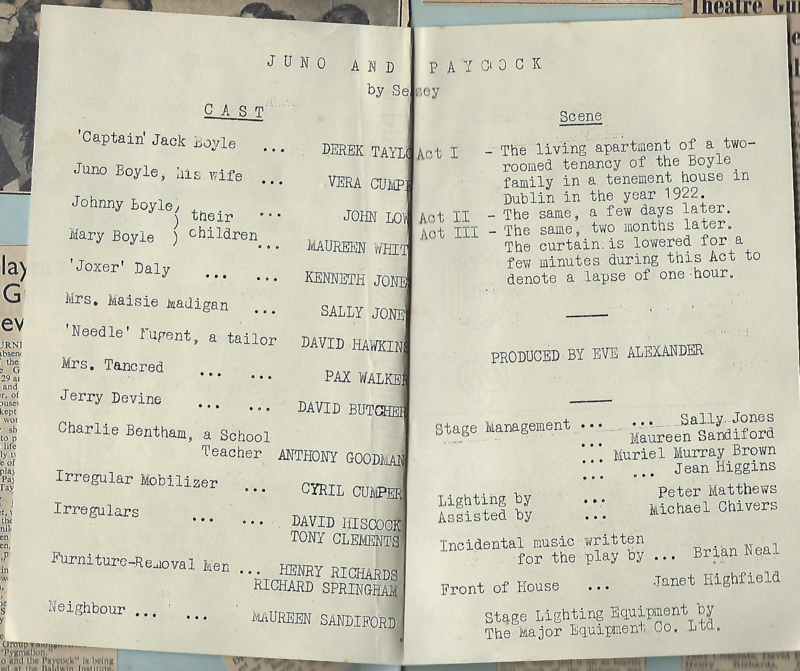 As they left for the evening performance of “Juno” it was time for me to leave for Dun Laoghaire and home. 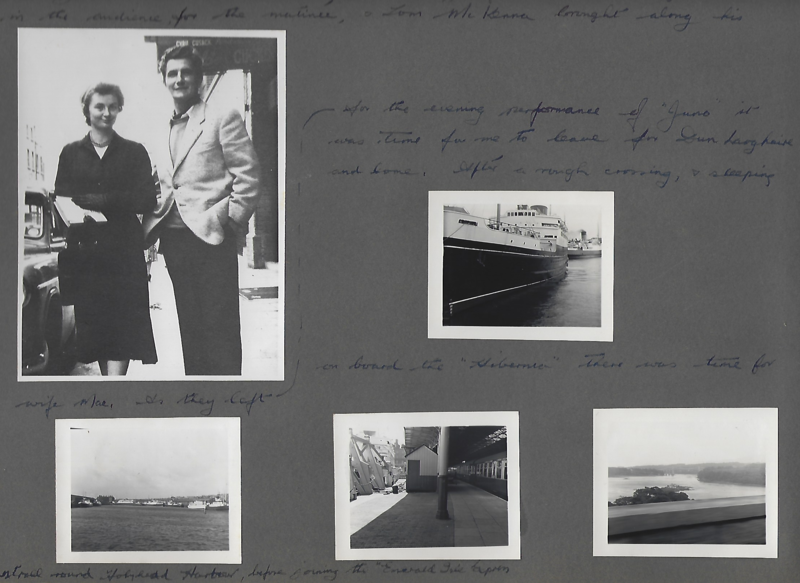 After a rough crossing, & sleeping on board the “Hibernia” there was time for a stroll round Hollyhead Harbour, before joining the “Emerald Isle Express”. 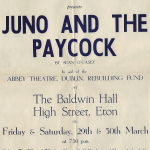 As part of the Windsor Theatre Guild David helped stage a production of Juno and the Paycock in 1957 to benefit the Abbey Theatre Rebuilding Fund. 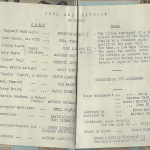 He played Jerry Devine in the production and you can see a photograph of him sharing his photos of his trip to Dublin with members of the company. 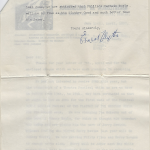 Also in the album is a letter from one of the Directors of the Abbey, Ernest Blythe, thanking David and the Windsor Theatre Guild for the donation. 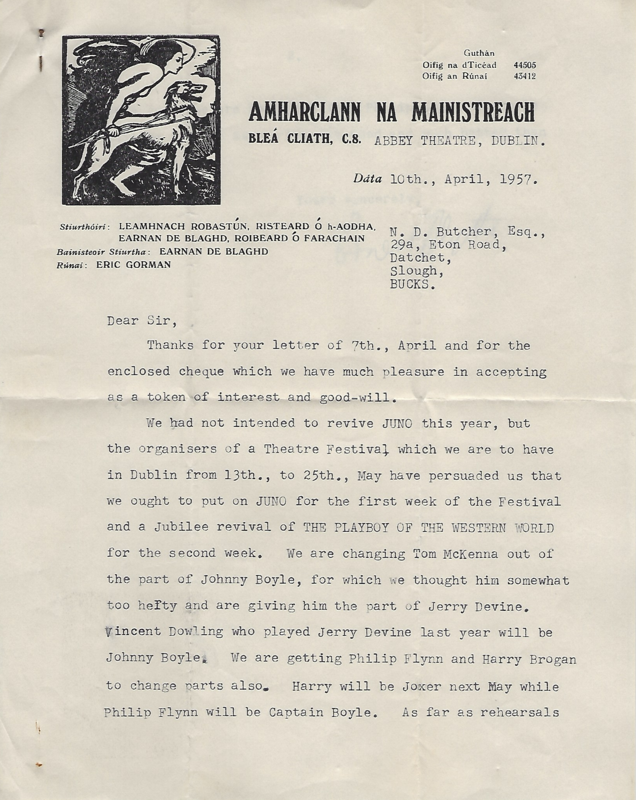 David must have enquired about any plans the Abbey had to mount a production of Juno and Mr Blythe responds that they may put the play on as part of a theatre festival with Tom McKenna moving from the role of Johnny to that of Jerry Devine. 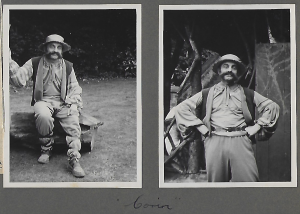 The same role David had just played. 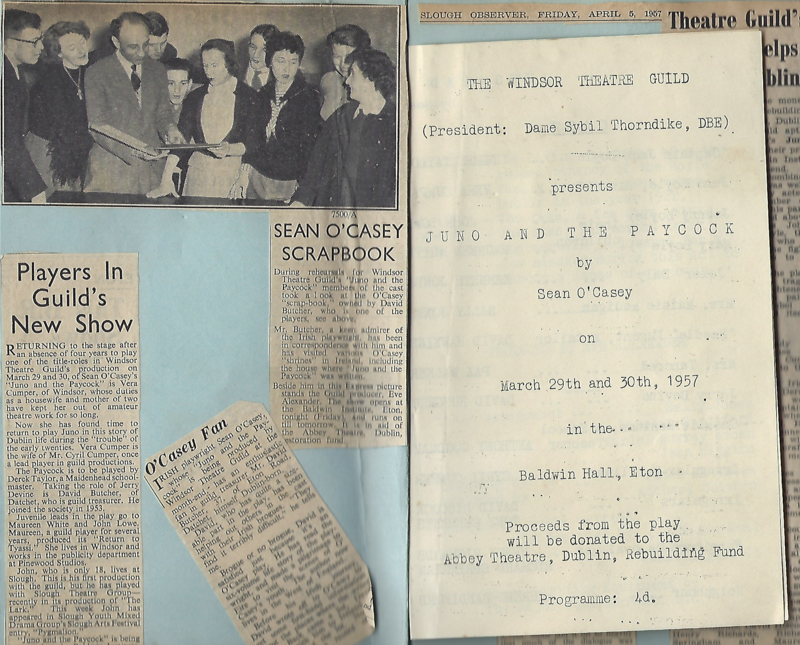 Sean O’Casey Scrapbook During rehearsals for Windsor Theatre Guild’s “Juno and the Paycock” members of the cast took a look at the O’Casey “scrap-book” owned by David Butcher, who is one of the players, see above. 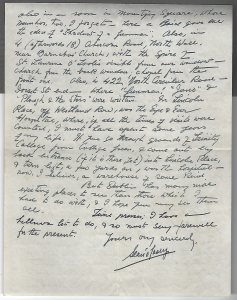 Mr. Butcher, a keen admirer of the Irish playwright, has been in correspondence with him and has visited various O’Casey “shrines” in Ireland, including the house where “Juno and the Paycock” was written. Beside him in this Express picture stands the Guild producer, Eve Alexander. 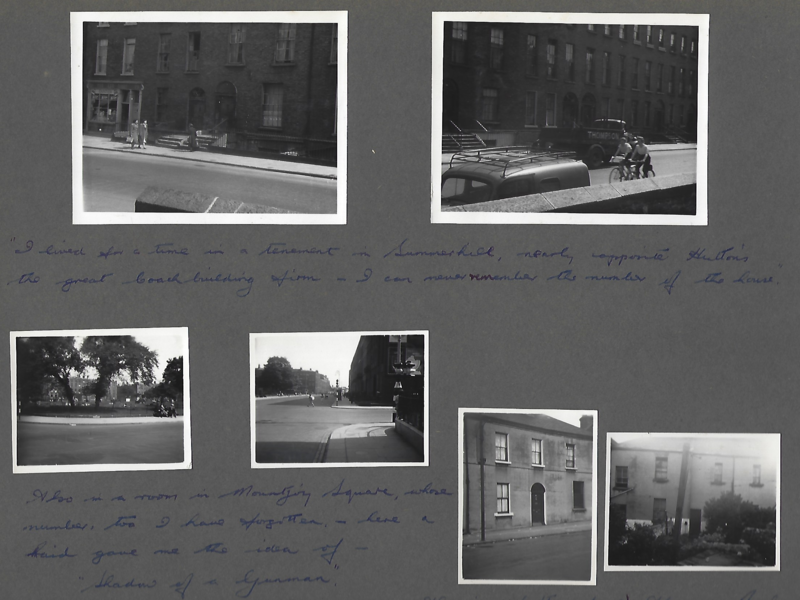 The show opens at the Baldwin Institute, Eton, tonight (Friday), and runs on till tomorrow. 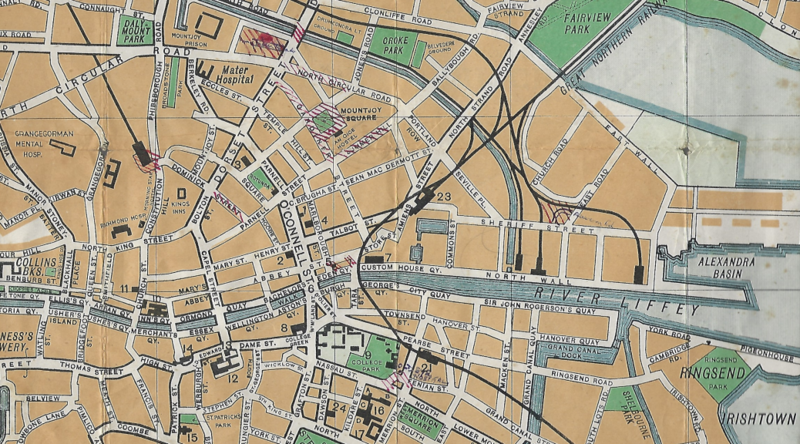 It is in aid of the Abbey Theatre, Dublin, restoration fund. 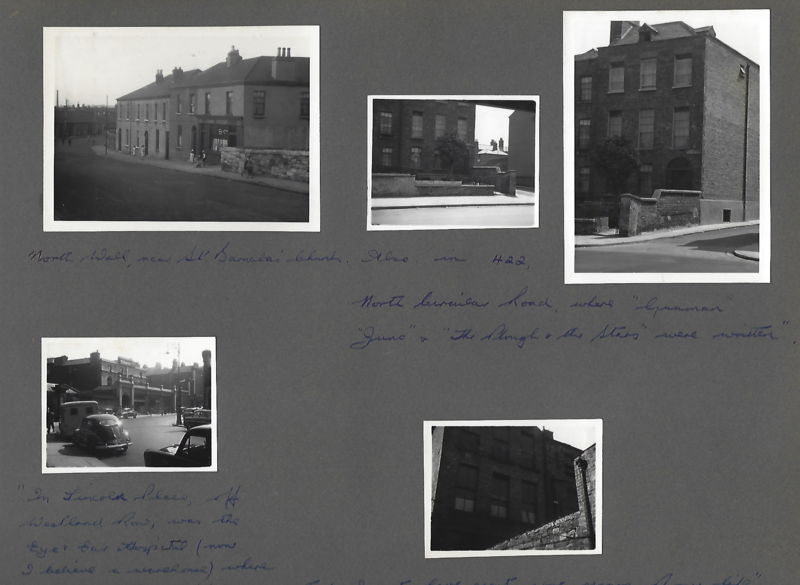 It has been wonderful to receive the scans of this album and to learn the story from David’s family. 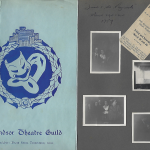 Amateur theatre is a vital part of our cultural life and it is heartening to hear a story of how an interest and correspondence with Sean was part of the passion of someone as committed to theatre as David Butcher. 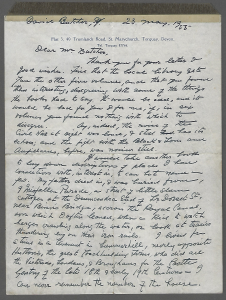 Stories live in the telling. 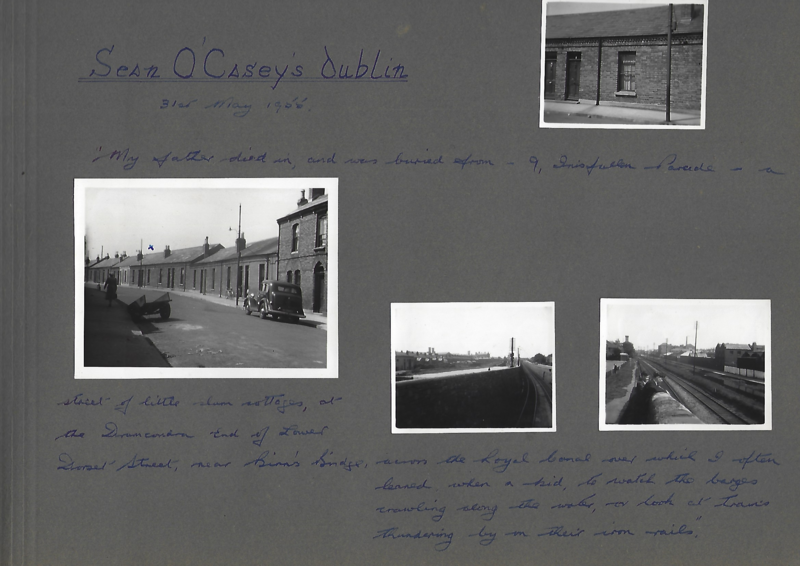 David’s passion for Juno and Dublin came together to make a new story and to help rebuild the Abbey Theatre. 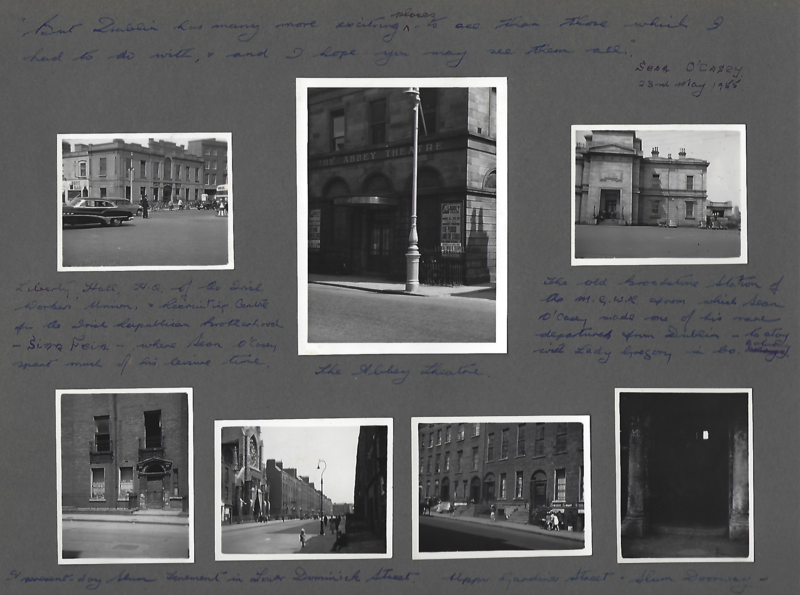 The photographs he took in Dublin in 1956 are a fascinating bridge between the time Sean lived in the city and now. 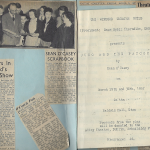 His viewing of Juno at the Queen’s Theatre, meeting Tom McKenna and then performing in the play himself picks out a brilliant thread in the web of theatre. 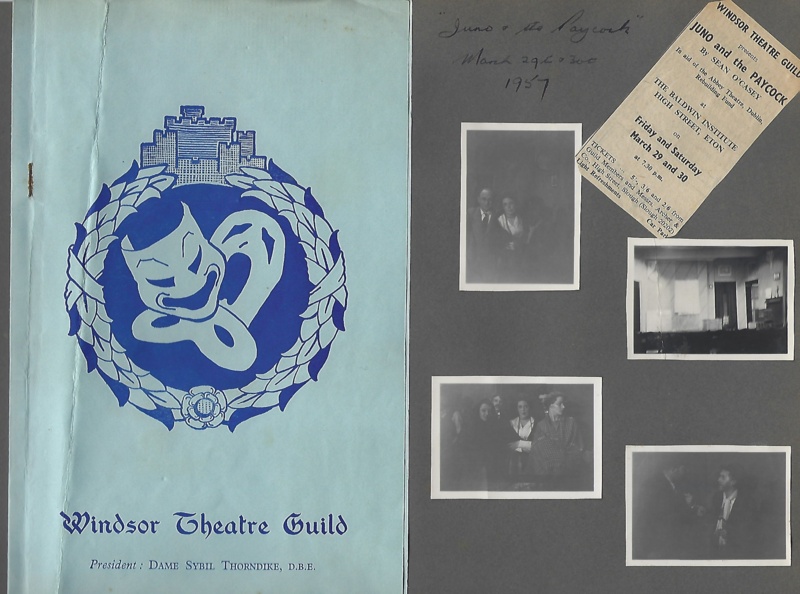 As Hugh Levey relates David was active in the theatre for more than 40 years and played many parts. Included in the album are two photos of him in the role of Corin, the shepherd, from As You Like It. 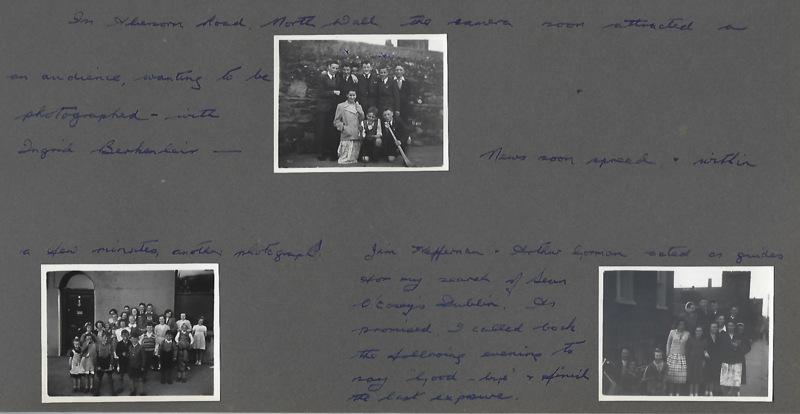 Thank you to David Butcher’s family, in particular Hugh Levey, for allowing us to use David’s scrapbook in this post. 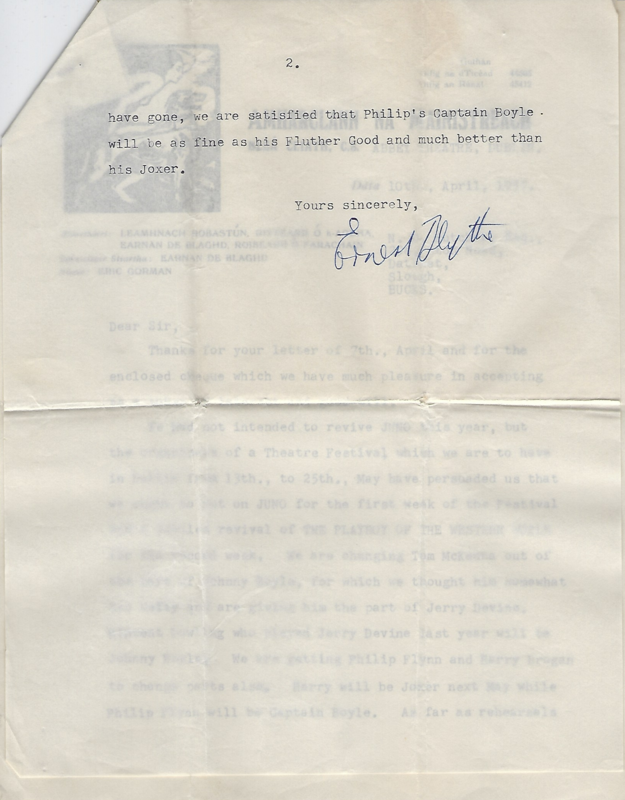 We hope that Sean’s letter and David’s archive will find a suitable home where it can be made available to those interested in this story about the community of theatre and how Dublin and Windsor connect through one man’s passion for a play.